Aberdeen suffered a miserable afternoon at Fir Park as their Betfred Cup final preparations were dented by a 3-0 win for Motherwell. It was a day to forget for the Dons who faded badly after a bright start and the Reds can have no complaints following a poor display. Dons boss Derek McInnes made one change for trip to Fir Park with Andy Considine replacing the injured Mikey Devlin in central defence. Devlin missed out after suffering a foot tendon injury while on international duty with Scotland. The Dons controlled the opening 20 minutes with Stevie May forcing a save from Mark Gillespie before Graeme Shinnie fired wide but they found themselves a goal down in the 24th minute when Niall McGinn’s poor pass sent Danny Johnson away and he beat Shay Logan before firing past Joe Lewis. Well had struggled to impose themselves prior to their goal but, boosted by their opener, they wasted little time in doubling their lead with Johnson heading a Curtis Main flick-on past Lewis on the half hour mark. 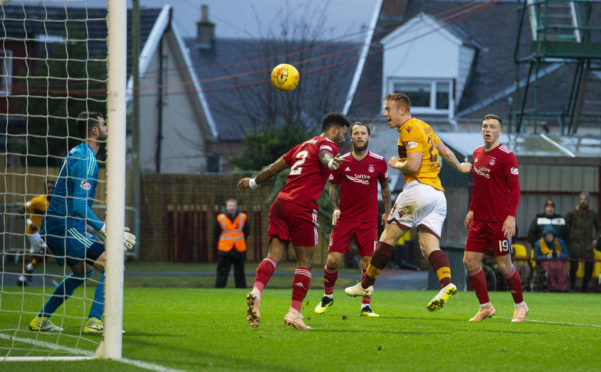 McInnes sent Sam Cosgrove on for the second half in the hope of getting back into the game but it was the Steelmen who struck again in the 55th minute when a clearance ricocheted off Main into the path of David Turnbull and he fired past Lewis.